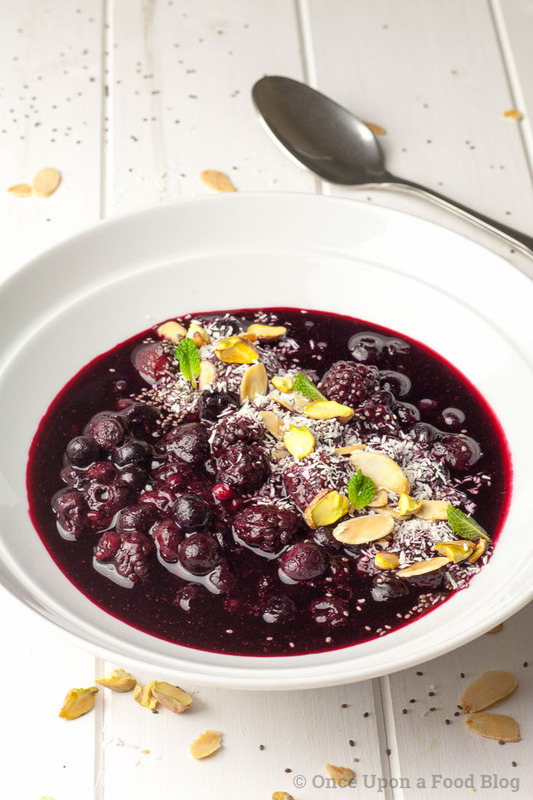 This Quick Berry Breakfast Bowl with Nuts and Seeds makes a perfect winter breakfast. It’s packed full of vitamins, minerals and antioxidants, is warming and delicious. I told you last week about my ‘Eat Everything’ challenge. One of the fruits on the chart that I practically never eat is blackcurrants. I don’t really like the taste of them on their own and they don’t crop up all that often – except, I’ve discovered, in bags of mixed berries where they appear to make a regular appearance. Hooray! 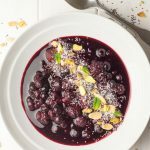 I’ve been making this Berry Bowl (AKA berry soup in our house) ever since I found them. A gorgeous low carb option is to serve it with the nuts and seeds scattered on top and some creamy Greek yogurt on the side, followed with a scrambled egg or two if you wish. You could also try it with granola in place of the nuts or swirled into a bowl of hot porridge. I make this in advance and keep it in a jar in the fridge. It keeps well for a good few days. I just re-heat a bowlful in the microwave each morning. The portion sizes are generous. If you’re just stirring a spoonful or two into porridge, then this will make around 10 servings. In the recipe, I’ve given you the option to add sugar. I leave it out as I’m trying to keep my sugar intake low but feel free to stir in a spoonful or two if you wish. 1 tablespoon each of flaked almonds, desiccated coconut, shelled pistachios and chia seeds. 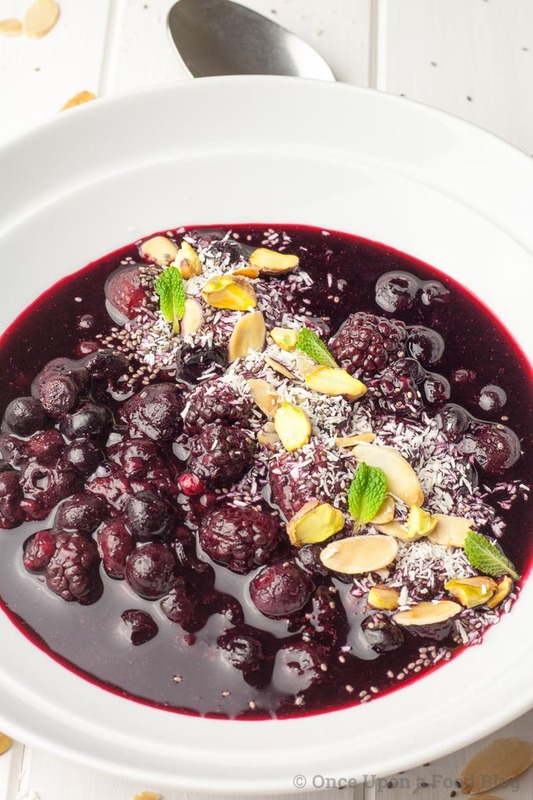 Tip the berries into a large pan. Add a small splash of water, place the lid on the pan and heat over a low to medium flame, stirring occasionally, until the berries have defrosted. Increase the heat slightly and simmer the berries for a minute or so. Add sugar to taste, if using. Toast the flaked almonds in a dry frying pan until golden. 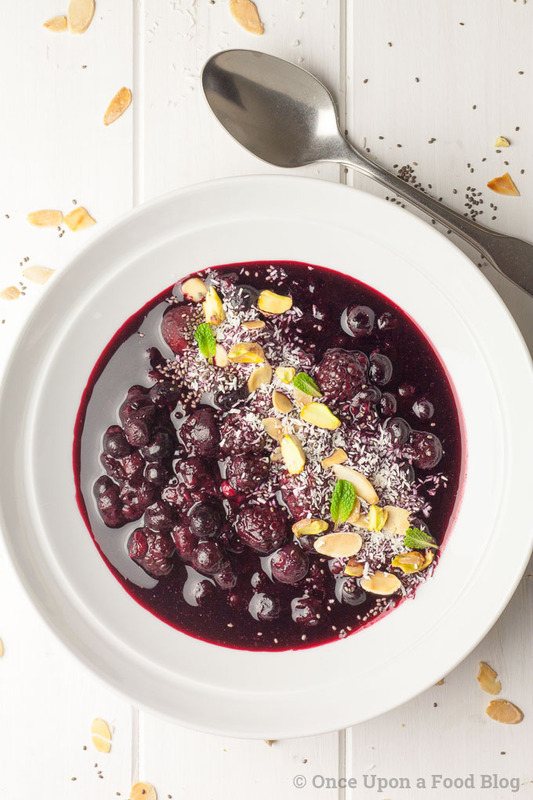 Spoon the berries into bowls and scatter with the nuts and seeds. Serve with the natural yogurt if you wish.